It’s the advertising equivalent of rubbing a burger in a competitor’s face. Following McDonald’s decision to do away with its Angus Third Pounders, the CEO of CKE Restaurants, the parent company of Hardee’s and Carl’s Jr., has taken to YouTube to sympathize with disgruntled customers and invite them to visit his restaurants instead. Then in a moment made possible only through social media, Puzder shares a couple McDonald’s customer laments. Hoping to attract these unhappy customers, Hardee’s and Carl’s Jr. are offering a coupon at ReclaimYourAngus.com for their 100-percent Black Angus Beef Six Dollar Burgers. The burgers are actually $6 in name only and refer to the amount consumers would pay for the same type of sandwich at a casual-dining restaurant. 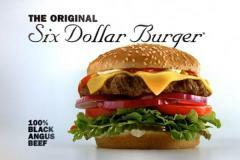 The Six Dollar Burgers’ launch in 2002 prompted a wave of fast-food chains, including Burger King and McDonald’s, to follow suit. Gradually though, the chains abandoned these pricier burgers. “When McDonald’s kind of pulled out of the field for competition for a restaurant-quality burger, we decided it was time to take advantage of that and let people know that the first major fast-food chain to have black Angus burgers still had them,” Puzder said. McDonald’s decision to do away with the Third Pounder came down to wanting to give consumers more options and a burger that’s less expensive than the Third Pounder, said Darren Tristano, executive vice president at Technomic, a market research firm. The new Quarter Pounders are also less meaty, which might appeal to a female consumer, he hypothesized. Consumers wanting a heftier meal can merely upgrade to a Double Quarter Pounder, which provides another option. Strained consumer demand because of a payroll tax hike and higher gas prices has also caused restaurants to rethink their menus, which resulted in stripping out some of their higher-price items. McDonald’s decision to do away with its Third Pounder in favor a three new Quarter Pounders is one example of this. In the face of rising labor costs and the looming implementation of Obamacare, which also is anticipated to raise the company’s costs, CKE is finding other ways to tinker with costs rather than cut the beef. The company is testing out having people use tablets to order rather than speaking with employees and paying more attention to scheduling. It’s also promoting whatever commodity is most reasonably priced at the moment—in this case, beef. Although beef prices for items such as steak and pot roasts have risen, prices for one cut used in ground beef, called lean trimmings, have actually fallen from year-ago levels. “I think it’s probably been a pleasant surprise for the fast-food industry because they came into this year envisioning having to pay higher prices, which is what’s been the trend since the recession,” said Kevin Good, a senior analyst at Cattle Fax, a beef industry research firm. Because of a severe drought in the U.S. central and southern plains, many farmers chose to slaughter their older cows rather than pay for feed, Good said. This led to an increase in supply and drove down prices. But recent moisture in the northern plains will likely cause an uptick in lean trimmings in the second half of the year, he forecast. Although Puzder’s ad might seem confrontational in other industries, Technomic’s Tristano insists that poking fun at rivals in ads has been occurring more in the burger biz. “I think when you’re in the fast-food category, you can’t take yourself too seriously,” he said. _ By CNBC’s Katie Little. This entry was posted on Thursday, June 13th, 2013 at 11:54 am and is filed under Burger, Coupons, Franchise Activity, Future Plans/Announcements, McDonald's, Menu, Menu Development/Innovation, Menu Trends, New Product Tests/Mentions, Price. You can follow any responses to this entry through the RSS 2.0 feed. You can leave a response, or trackback from your own site.